at the Rourkela Press Club, on 27th May 13. How can the Supreme Court pass an irrelevant order?, wondered Sri B.Vaidyanathan, Chief Mentor, Consumer Protection Council, Rourkela, while addressing the media at the Rourkela Press Club, on 27th May 13. He was on a visit to Rourkela, to participate in the Annual General Meeting of CPC, Rourkela, held on the 26th. Sri Vaidyanathan narrated the systematic efforts made by the Council to unearth the huge loss suffered by the consumers on account of under-weighed 'Indane' LPG (cooking gas) refills supplied across the country, due to shortcomings in the 'Indane' LPG bottling plants. 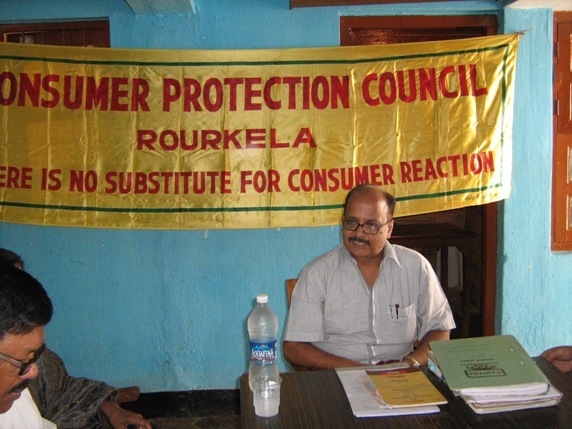 CPC, Rourkela, had to approach the National Consumer Disputes Redressal Commission (NCDRC) in 2001, as the Indian Oil Corporation (IOC) was not even willing to accept the problem. Based on the findings of the IIT, Kharagpur Professors and the recommendations of the Committee set up the government of India, the NCDRC directed the IOC to automate the LPG bottling plants, in 2007. But, though the Consumer Protection Act had been amended, in March 2003, incorporating provisions for the award of "punitive damages", award of "a minimum of 5% of value of defective goods sold in the market" and for the award of "adequate costs" to the litigant and which are applicable in the case of CPC, Rourkela, were not invoked by the NCDRC. This, in spite of the fact that the Council brought these to the notice of the NCDRC, in Jan. 2004 itself, much before it passed even the interim orders, in Oct. 2005, Sri Vaidyanathan stated. As per the estimates submitted by the Council, to the NCDRC, defective (short-weighed) 'Indane' LPG refills worth over Rs. 65,000 crores had been sold by the IOC and as per the provisions of the Consumer Act, IOC should have been directed to pay at least Rs. 3,250 crores to the Consumer Welfare Fund, Sri Vaidyanathan emphasised. But the National Commission remained silent in its order and had declared its inability to consider it under the review as well. Hence, CPC, Rourkela, appealed to the Supreme Court, under sec. 23 of the Consumer Protection Act. In gross violation of the provisions under which the appeal was made and with scant regard to the facts of the case and the appeal, the Supreme Court concluded, in Dec. 2012, that the appeal had become 'infructuous', as both the government and IOC had been complying with the directives of the National Commission, Sri Vaidyanathan said. He further said that when the order of the National Commission was questioned in the appeal made under sec. 23 of the Consumer Protection Act, the Supreme Court was only to decide whether there were any shortcomings in the impugned order of the National Commission. An appeal made under sec. 23 cannot become 'infructuous'. It can either be maintainable or not. It appears as though the Supreme Court had not even understood the basis on which the appeal was made. The Review Petition highlighting these shortcomings was also dismissed in Feb. 2013. Sri Vaidyanathan wanted the media to highlight the unreasonableness of the order of the Supreme Court, so that the issue reaches all concerned.